I mean, not actually no socks, because that is pretty much inconceivable. It’s not that dramatic, I finished these in June. a) I love them with all my heart, and b) they are being test knit as I type. Feeling a lot of love for my amazing test knitters right now for working on colourwork socks during this INCESSANT HEAT (srsly, I cannot remember a heatwave like this, but at the same time I get to loll around in the garden a lot and watch all the World Cup games so in some respects it’s a pretty fine time to be alive). 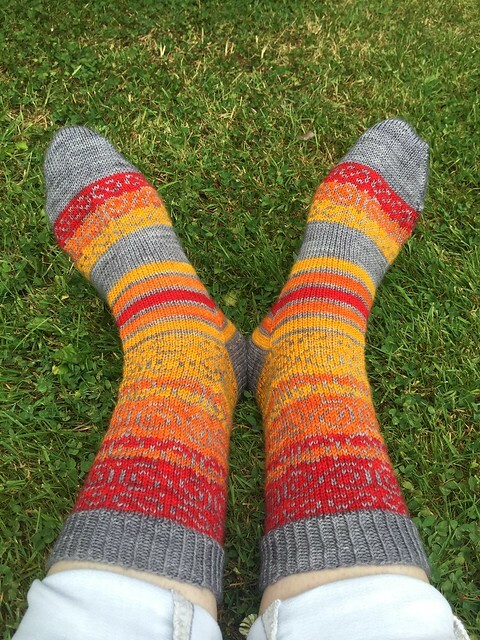 Pattern launch in August I hope – though my Retro dream socks are launching later this month so watch this space! However what I really mean is that right now I have no new socks on the needles. Eek! I am sure I will have rectified this by this time next month, but as I type I cannot tell you what my next sock project will be. What is going on, eh? In the meantime, if YOU knit socks and feel like blogging about it, why not join our monthly sockalong? Check out Paula’s post for more deets, and you can see my friends’ other posts (and sign up directly if you like) right here. Enjoy! So I said earlier that your patterns have cost me a fortune and entered my dreams.. you’ve done it again. These are stunning. Those colours! Keep at it! 😃 you’ve obviously got a real talent. Very pretty… although the thought of those poor test knitters doing colourwork in a heat wave! I put my wool socks aside and cast on some bamboo socks to knit until my fingers stopped sweating. Love the stripes mixed in at the gussets! I hope the test knitting goes well. Thank you – so far so good, getting lots of useful (and positive) feedback!